Categories: Featured, Plus Size Tights, 90 Denier, UK 16 -18, UK 20 - 22, UK 24 - 26, UK 28 - 30, UK 32 - 34. Where have these tights been all my life?? I am a nurse and have spent the last 10 years wearing uncomfortable tights that need pulling up all day. I can not describe how comfortable these are. They are a total game changer and I will never wear cheap tights EVER AGAIN!!! Just bought my first pair of tights, WOW WOW WOW!! For the first time I have found tights that fit, don’t dig in or roll down and pull up easily! Thank you so much! These tights have saved me, I can wear dresses and skirts without feeling uncomfortable. Amazing! Honestly these tights are bloomin briliant! Fit lovely..comfy..Will be a returning customer for sure! Just have to say, I bought two pairs of your tights recently for the first time. I wore a pair of the 90 denier ones yesterday, as I was putting them on, being only 5 foot with 27″ leg length I was pulling them up my legs thinking “oh my god they are huge, the legs go on for miles, they aren’t going to fit!” HOW WRONG COULD I BE, THEY ARE AMAZING!!!!! They feel big but they fit amazingly well, I had no ‘Nora Batty’ ankles (Brits will get that reference lol), NO wrinkling or bunching AT ALL. They are SUPER stretchy, & soft & so so comfortable. Because they are super stretchy, I didn’t get any tightness on the old thunder thighs, so no soreness like I have had with other tights, & I can pull the waist band right up to my bra, but it actually stays, no rolling down, no digging in. I AM SO HAPPY I BOUGHT SOME!! I bought a pair of these tights when they were on offer. As an avid hater of tights as in I’d find trousers to wear rather than a skirt/dress but these tights are THE comfiest I’ve ever worn! I just wanted to let you know I am thrilled with the tights I received this morning. I am a large lady size 24 and have a spinal cord injury which mean I have to wear incontinence pads all the time. I have struggled for 10 years to find tights that are roomy enough to accommodate the bulk of the pads. I have spent a fortune on different pairs only to find the back rides down due to the pad bulk. I have just put my tights on and feel comfortable for the first time in 10 years. I will definitely be ordering more of these fabulous tights. I’ve been prancing about the house like an idiot in these tights, I am genuinely shocked at how comfortable and easy to move in they are. I was a bit sceptical at the wide size range, being at the far end of the 22-32 (28) spread but these fit perfectly. Thank you so much! These stayed up for an entire ceilidh on the first outing! Can’t ask for more than that, thank you! These tights are well worth the price! I’m a size 20/22 and I struggle to find tights that fit even from plus size brands. These tights stay on all day don’t fall down. They are so comfortable. I have never been able to wear tights – all the tights on the high street are just too small and short. I couldn’t believe it when I put these on, they are so stretchy, long and really comfortable. Totally worth the price and I am about to purchase another pair! I cannot begin to sing these tight’s praises enough. They are the best I’ve ever owned and will buy several more pairs again! Absolutely incredible tights I must say! As a midwife I have to wear tights for busy 13hours hospital shifts. I was sick of constantly pulling or holding up my tights, although running down a corridor whilst holding the waist band my be amusing for some, it started to become increasingly annoying. Then I tried yours! There isn’t any movement of them all day! I couldn’t rave more highly about them! I’m size 26 and over 6ft so I’m sure you can understand the struggle! Don’t hesitate to buy, sure they are a little more expensive but a pair of hell tights from another plus size retailer were nearing £10 so for the quality and difference, theses are worth every penny!! Hooray! I bought these tights for my Christmas party this year, and will be buying a few more pairs! I was a bit skeptical due to the price but oh are they worth it. I’m only 4ft 10, so tights for me either fit right in the waist but are way too long, or the right length but too tight. These however are perfect and stayed up all night through the dancing. 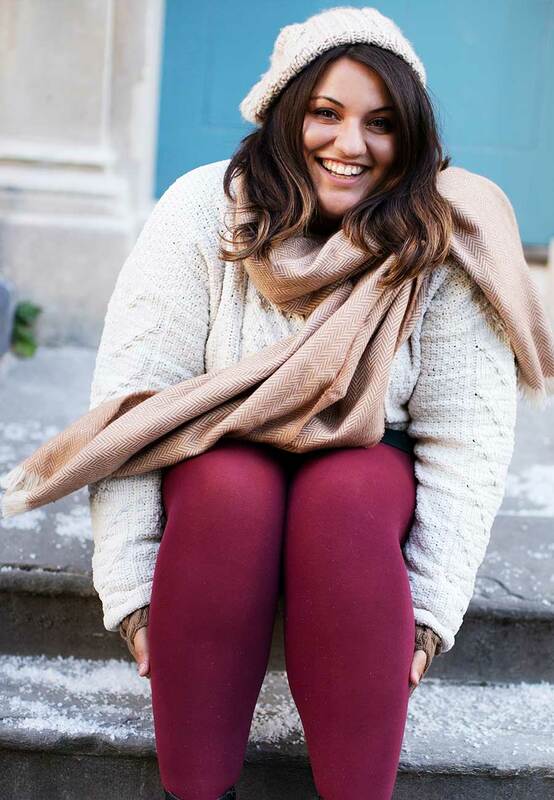 If you’re short n chunky, these are definitely for you thanks so much big tights! First up: these are amazing! I had these first when they first came out and they were frankly a disaster, they slipped and fell down. Now however, with the improved fit, they are pure perfection! They don’t sag, there is not one wrinkle around my ankles, they stay up perfectly (road tested with 3 miles walking and a day’s work) and are so so comfy! I love these and would buy bulk if my bsnk account would approve. But they are so worth the price! Absolute amazing customer service. I emailed the company earlier this week as I have recently spent £30 on tights from Yours, Evans & Pamela Mann that don’t fit…always being too short…even though they say they fit up to 5’10…I’m 5’9! Frustrated as you cannot return tights, I emailed The Big Tights Company after reading about them on Instagram, explaining my frustrations and they kindly responded to my cry for help and sent me a complimentary pair to try for size. I sent a thank you email before placing my first order. Amazing customer service from a company that has clearly filled a huge hole in the tight market. Yay tights that are actually the size on the pack…lovely quality to boot! As a uk30 and 5ft11 I’ve always struggled to find tights, I was told to try the big tights company. I have to say they are the best tights ive ever tried. I had plenty of room and they was very comfy. Wouldn’t hesitate to order again. Absolutely love these tights. Im a size 25 (yup I’m in between sizes) and a rather leggy (I like to think) 5 ft 8. I have got enormous calves too. They have a teeny bit of a shimmer, so look great for a night out, are lovely and soft and best of all. They stay up!!!!!! Love these. Cant recommend them enough. Last year was my nephews wedding. I ruined 5 pairs of tights before ending up wearing pop socks (oh the shame!). I really wish I’d known about these tights before. They don’t feel like they would stretch to accommodate my size (24/26) when you get them out of the packet but when you put them on they have loads of stretch in them and they dont go thin where they’re stretched the most. No worries about them going over my thighs of hips as they just glide over easily. They’re not baggy and loose round the crotch and sit snugly around my waist despite me being only 5′ 4″. I can see they would fit bigger sizes easily and not drown anyone smaller. The opacity is great especially for the winter and there’s a slight sheen on them too which I love. They’re not the cheapest tights but they are excellent quality so great value. My tights arrived yesterday and I have them on today! WOW! I cannot tell you how delighted I am! I am 6 foot and a size 22 and, upon putting these on, have realised that a pair of tights have not fitted me for about 15 years! I spend my days struggling with standard tights that just about cover my tummy and roll down with every step! I finally feel that I can be confident to wear tights all day. Oh my goodness – what amazing service – my tights arrived this morning and I only ordered them yesterday. It’s fab that someone recognises the need for a little extra leeway around the hip area I haven’t bought a great deal from you but every time I do its a pleasurable experience. I tell all my friends about you so hopefully they have put orders in too. Keep up the amazing work. Where have these tights been all my life! These are amazing! Normally big girls have to struggle to get good fitting tights that go on easy and stay put all day. These are a dream compared to any other ‘plus’ tights I have ever had. They go on like a dream, have enough but not too much stretch, they are true to the denier the say. Basically they are perfect! I had been worried about tights/stockings for my wedding but I now know where I will be coming! Thank you, thank you, thank you!!! I’m a 5ft 3in size 22/24 woman who’s always had the struggles with trying to find tights that will cover my big behind and won’t fall down. My horror stories of tights slipping to my knees while on my daily commute have been a constant source of amusement to friends and family but not any more! I bought 2 pairs that were delivered yesterday and tried them on this morning…oh my god! Perfect fit, feel like a second skin and the stretch…wow! I think I actually prefer these to the 180 denier which I’ve bought previously. I’m now in the office feeling smug and have 3 more pairs in the basket! Please can we have these in grey and dark brown…oh and multipacks. Can’t recommend these tights enough! After being an absolute convert to their 180 denier style, I was immediately excited at the thought of owning another pair from their line. Firstly, if you don’t own a pair of the 180 denier tights – you should! They are extremely comfortable, stretchy yet supportive and my go to whenever I am off on a night out. As you’d expect, the 90 denier are much thinner than the 180. For me, they would be a day time, every day wear kind of tight. Although as the weather warms (god willing), I would not hesitate to wear them on an evening. They look significantly smaller than the 180 too, but dont let that fool you – they are small but they are mighty! My size 24/26 thighs glided in with ease. A luxury I am now used to thanks to The Big Tights company. Once on, they still provided the coverage I am used to with the 180, if only losing a little opacity on the thighs. They feel light, breezey yet supportive. The band came right below my bra and at 5’11, that isn’t an easy feat! I wore my high waisted shapewear briefs over the tight as always and I felt confident and comfortable. If you are looking for an every day, comfortable tight for work or leisure, or if you prefer a less bulky tight on an evening, then these are ideal. It was always going to be hard to beat the 180 denier for me, the 90 deniers almost managed it! With my large thighs and tummy, the opacity, fit and feel of the 180 suit my body better in my opinion. They will still be my go to tight but I am positive I will get plenty of wear in the summer from my fabulous new 90 deniers!